Pakistan’s interior minister, who has championed the country’s minority communities, has survived an assassination attempt by a gunman protesting against the country’s blasphemy laws. 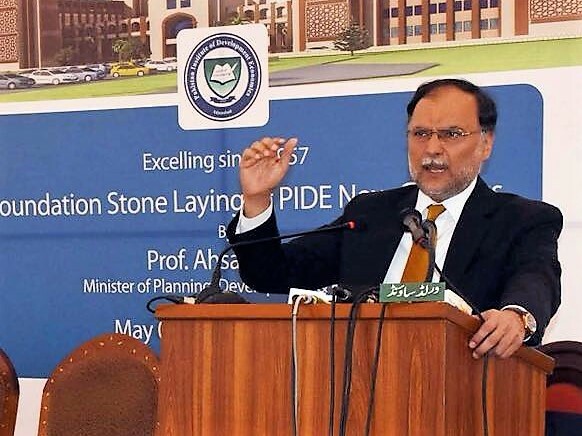 Ahsan Iqbal was shot in the arm before police overpowered his suspected attacker, 21-year-old Abid Hussain, the BBC reported. Iqbal was shot on Sunday (6 May) after meeting a group of Christians in his constituency in Narowal, Punjab province. He is known for standing up for the rights of Pakistan’s Christians, as well as Shia and Ahmadi Muslims. It is tragic to see hate speech against minorities in National Assembly. We believe in inclusive Pakistan. Pakistan respects all minorities. According to Reuters, his attacker later confessed to police that “his conscience told him” to attack the minister over accusations by the hard-line Islamist Tehreek-e-Labaik party that the government had committed blasphemy by trying to change an election law in a way that some people said weakened an oath declaring Muhammad to be the last true prophet. Police said they have “solid evidence” that Hussain is a supporter of Tehreek-e-Labaik, although the party itself has denied knowing him. The party opposes changes to Pakistan’s notorious blasphemy laws, and blockaded roads into Pakistan’s capital Islamabad in a 2017 protest that left seven people dead. Iqbal is the third high-profile figure to have been attacked by people supportive of the blasphemy laws. Former Punjab Governor Salmaan Taseer was shot dead in 2011 by his bodyguard Mumtaz Qadri, whose justification for the assassination was that Taseer wanted the blasphemy laws reformed. In the same year the Minorities Minister, Shahbaz Bhatti, was killed by gunmen shortly after leaving his Islamabad home. Before leaving the murder scene his assassins scattered leaflets saying Bhatti, a Catholic, was killed for heading a committee set up to review Pakistan’s blasphemy laws. Taseer and Bhatti both supported Asia Noreen, also known as Asia Bibi, the Christian woman sentenced to death in 2010 on blasphemy charges and whose fate is expected to be decided soon by Pakistan’s chief justice.